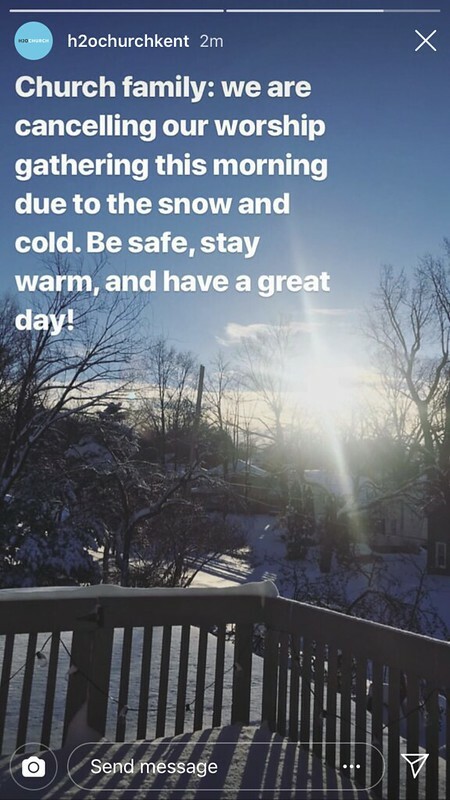 Northeast Ohio was hit by a massive winter storm this weekend: more snow over the last 24 hours than any other time I can remember, since our family moved to Kent in 2012. Many area events had to be canceled or postponed, with notices posted throughout the weekend on websites, social media, and scrolling announcements on local television stations. There was only one event for which I bore any real responsibility, however: the weekly worship gathering for H2O Church at Kent State University. And I have to say, our own cancellation was more difficult — both to decide and to execute — than I expected. And through it all, the snow kept falling. This morning, we woke up to about a foot (30 centimeters) of snow on the ground. My co-pastors and I started trading text messages around 7:30 AM, this morning. And we went back and forth on all the pros and cons of cancellation versus continuation. 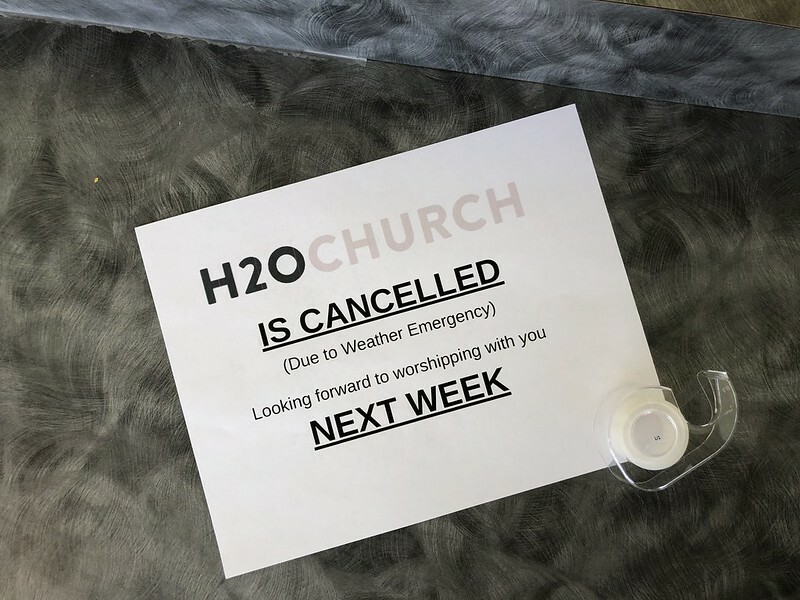 We looked at the weather reports from several different sources… We noticed that several other area churches were announcing their decisions to cancel their own worship gatherings. We observed more of the questions, rumors, and second-guessing within our own communication channels… And all of the chatter made it very difficult to wrap our heads around the dynamics of our decision. 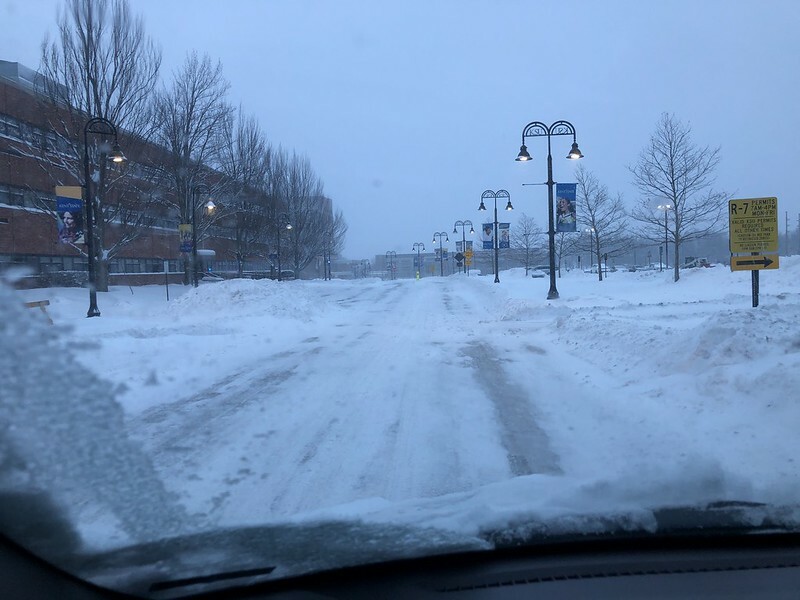 Ultimately, we decided that we couldn’t really make a decision until we got eyes on the snow removal efforts by the City of Kent and Kent State University. Unfortunately, in order to get eyes on the snow removal situation, we had to remove the snow from our own driveways! And with a foot of snow on the ground, that meant half an hour of heavy shoveling. As I started driving towards campus, the chatter on our internal communications channels started to intensify. 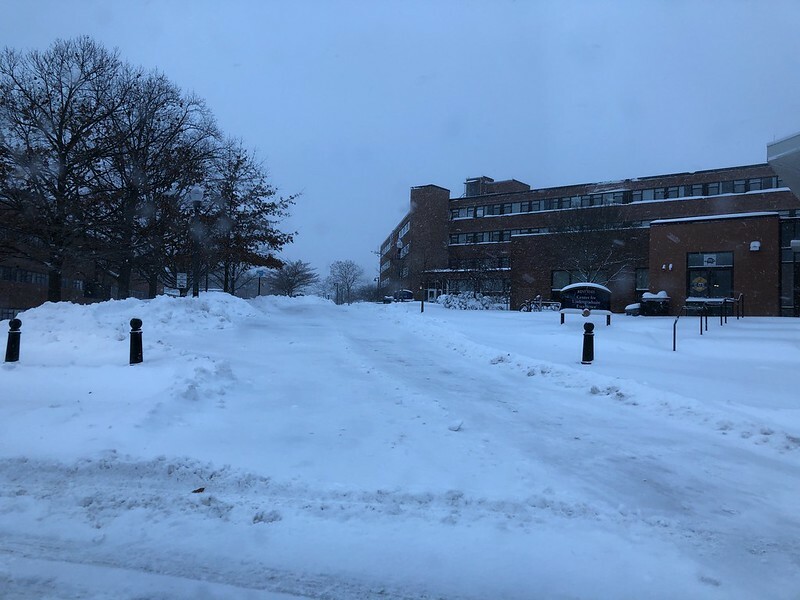 The secondary roads in Kent were still in pretty bad shape, though not entirely impassable… The main roads were surprisingly navigable… And campus sidewalks were actually in decent shape. While on campus, I picked up my co-pastor Jason (who had walked over to campus from his house), and we talked some more about the decision before us. The two of us were starting to lean towards a decision to “Carry on” with regular H2O programming… until we got to the street where Jason lives. I started turning onto the lane and suddenly thought better of it. No plows had been through yet. But just as I started turning my wheels back towards the more primary thoroughfare, the car’s forward momentum ground to a halt, and we were stuck fast. That was the turning point in my own decision. It didn’t take too long for us to dig ourselves out of the snow (Jason’s house was very close by, and he had a couple shovels we could use to clear the short path back to clearer roads). We drove over to the house of our (third and final) co-pastor, Matthew, and then we cruised around the streets of southern Kent while we deliberated all the angles. We almost got stuck a couple more times. And by 8:45 AM, we all felt peace about a decision to cancel our worship gathering. 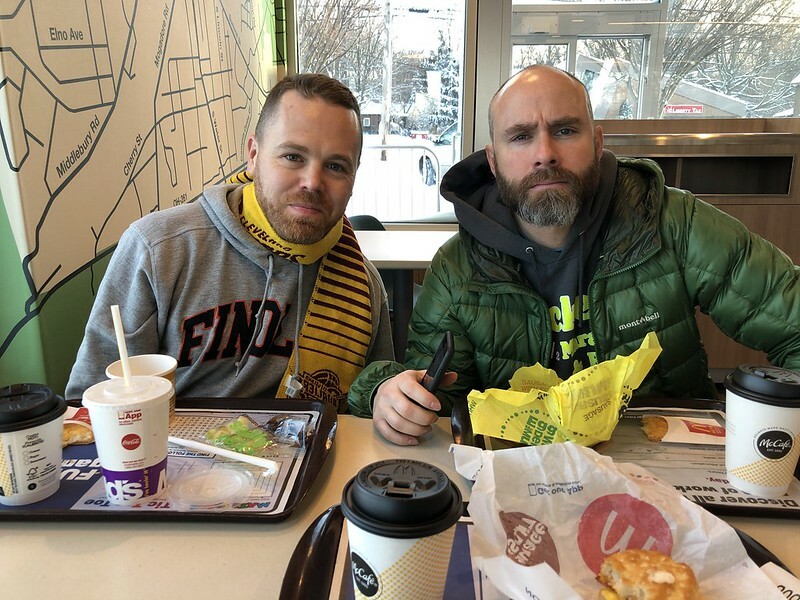 We pulled into a McDonald’s and started working on communication with all the other people who play a role in our Sunday worship gatherings. First, we told our staff team. We then asked our colleague Brooke to put out the word on our social media channels, figuring out the nuances of our message together with Matthew. After that went live, we asked our Staff to push out a screenshot of the social media announcement to all the various groups that make up our church. We reached out by phone or text message to some of the people we suspected might not otherwise hear the news. We were all on our smartphones for a good 20 or 30 minutes, trying to get the word out. As we worked, we talked about how we might be able to streamline our communications process for future situations along these lines. Eventually, we were able to start to relax a little bit. We took some time to deliberate the options for H2O events scheduled later in the day (ultimately deciding to cancel these events, too). We worked on communication stuff a bit further. We talked about other church stuff. And finally, we finished by arranging to print out some 8.5 x 11 sheets of paper to tape to the doors of Bowman Hall, in case none of our other communications made it through to individuals. It wasn’t a perfect process. We’ve got a lot of ways to learn and grow in the future. But I’m glad we were able to figure it out, together as a team, and I’m glad to be nestled in at home now as the snows keep coming. This entry was posted in Church, H2O Kent, Kent, Leadership, Weather. Bookmark the permalink.